The American high school education system focuses too much on students’ weaknesses rather than the things they are passionate about. Students have often felt isolated and bored in classes that they do not enjoy and are not interested in. In my sophomore year, a year where I attended an American school based in London, I spent the majority of my days working on chemistry and geometry for an average of four to eight hours per day. I visited my teachers twice a day and asked question after question. Only about half the time did I leave my teacher’s office understanding the content. On the other hand, I thoroughly enjoyed my English, band and history classes, but I was able to spend only thirty minutes to an hour on those subjects because I was so busy stressing about my math and science classes. Even after all of this effort and time, I finished both courses with grades I was not satisfied with. The American high school education system focuses too much on students’ weaknesses rather than the things they are passionate about. Now, I’m a senior here at a traditional public high school and have found my experience to be no different. Because of the insane pressure to have the perfect “well-rounded” college application, I spend egregious amounts of time pursuing participation in clubs and activities that are meaningless to me. And all in the name of well-roundedness. Because of the desires of both universities and scholarships, high school students are taught that they must be involved in everything in order to look good on paper. Sure, if you work hard to improve your flaws, you will improve over time. However, it is not working on your alleged “faults” that takes you to new heights; it is accomplishing goals that you never thought possible, dreams that you’ve always had. Students will not make a difference or achieve greatness by spending all of their time and energy on the topics they dislike; rather, they must be allowed to focus on subjects they love that will hone their skills and passions. In this way, not focusing on students’ strengths can also lead to a career path that they may not actually have a desire to go into, resulting in unhappiness in the workplace. When students are forced to center the majority of their time on things they dislike or do not care about, they tend to get stuck in jobs that they do not enjoy in the slightest. As a result, young people do not find their true passions until far too late in life. It’s not just high schools that are mandating a focus on imperfections, but companies too. This certainly raises the question of whether the people in our country are ever able to truly hone the skills they are excited about. In a survey of Sage Creek students, 72 percent of students say that they agree that they have to focus too much on their weaknesses. The Sage Creek student body was only one of several schools that have similar sentiments. 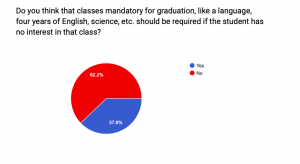 Almost 63 percent of Sage Creek students feel that classes students have no interest in should not be required for graduation. These classes included four years of English, science and a foreign language. In a survey of Sage Creek students, 72 percent of students say that they agree that they have to focus too much on their weaknesses, while almost 63 percent were found to believe that classes like foreign language and science should not be required for graduation if students have no interest in the subjects. Therefore, a significant amount of high school students on our campus are not satisfied with the status quo and have a desire for an education system that caters more towards the likes and dislikes of the individual rather than an overly-standardized system that jumps to inaccurate conclusions. For example, students who live in Austria are allowed to specialize early on. An Austrian student who recently visited the United States told me that he is currently in engineering school, yet he is only seventeen. In this way, Austrian students are still exposed to a variety of subjects, they are just allowed to decide their main career path while still a teenager. By doing so, students are able to start their careers earlier and are benefited because of it. There are some who would argue that students must take a wide variety of classes during the entirety of high school and even some more in college in order to be well-rounded individuals. However, the word “well-rounded” is hardly usable anymore; students are no longer well-rounded, but mediocre-rounded. 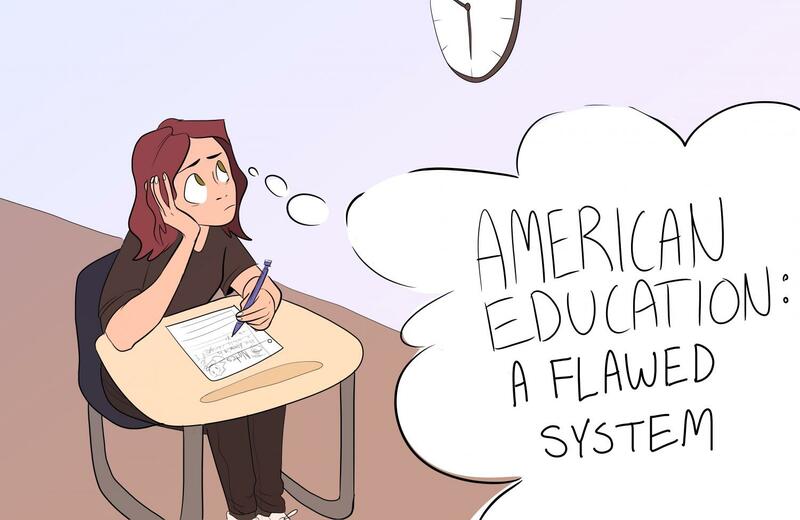 Although having a wide variety of experience is important, I feel as if in the United States students are taught to be mediocre at everything rather than talented, passionate and motivated in a few things. I am not saying that students should only take one class and decide their major in their freshman year of high school; rather, I am asserting that students are being forced to use much of their time on topics that are not relevant to their future instead of subjects that are. So the next time a student complains about a class that is painfully boring or difficult, have a little sympathy. Being a well-rounded citizen and being a competitive force in the job market place requires an individual to be well rounded in the most basic forms of secondary education.If a student has no interest in science that shouldn’t mean they just get to skip science, developing the problem solving and analytical tools is critical to future job prospects. High school is annoying, it has been by far one of the most tedious experiences both socially and academically. As a current college student, I can attest that Sage Creek High School completely over prepared me for my classes and has given me the tools to succeed while others are not competitive at all. You are all stressing about the “non essentials” but they are essential. Even Bio-A and B, two of the most basic courses were taught in such a manner that the content being taught was in depth but built for Freshman to understand. No matter where you go in your education you will still have to take GE’s in college if you do not take AP classes beforehand. People in my classes don’t even know how to write a lab report or conduct proper testing while you guys are spoon fed some of the best methods a high school has to offer. A foreign language is my least favorite thing to learn in school but it is by far one of the most robust abilities to have in the vastly diverse demographics of California. You say that our school is a traditional high school, and you are complaining that school makes you work too much for activities like “math and science.” But… this is a STEM school. We aren’t exactly traditional as we have trimesters well. In addition, many of our teachers are recent graduates from college and are minimally experienced in teaching. My point is, you can’t use Sage Creek as the typical model for the American education system. Yes, it is true, our school focuses on math and science, but isn’t that the point of a STEM program??? I’d assume over half the people that go to this school want to major in science or engineering. That’s the exact reason the school makes you work hard on those specific subjects. A flaw to your student survey is that you asked “IF a person is not interested in a subject” should you not take the course. Not to mention that another flaw would be that students have a bias against school in general. Overall, I agree that the education system focuses on weaknesses rather than strengths, but you really can’t get mad that our school is all about math and science and use it as an argument. Life doesn’t always go the way you plan, so sometimes you might need the ‘well-rounded’ approach to a situation. The education system requires that people be well-rounded so they can expertly complete all processes involved even in the subjects they are most passionate about. Science gives students an edge in listening and observing, analytics, and presenting their knowledge. If a student does not want to do science, they will likely fail in their writing skills and presentation skills, which is essential to job interviews , resumes, scholarships, and general applications. World language gives students an edge in open-mindedness and intelligence. Students who learn world language gain a wider perspective and influence, as well as travel more efficiently, which is helpful in the work environment. Strength and talent is only one of several aspects that a person sharpens over time. One must support their powerhouse skill with other essentials to fill the gaps in their job requirement. A person who is excellent at math and science aspiring to be an engineer will not become an engineer if they are unwilling to write summaries and reports and document lots of information. There is nothing that the work environment likes more than being prepared.